I am beyond excited to show you my latest project for Shutterfly PLUS a sneak peek at the bridal shower I'm throwing for my sister in June! This is actually a sneak peek for her too ... so fun! I don't think I have shared the news yet that she is engaged! Exciting things happening in the Murphy family! First off, a huge thank you to The Mint for letting me use the space to shoot. It's so gorgeous! So my inspiration for the shoot was this fancy little number up there ... how gorgeous are these bridal shower invitations? I went with a garden party theme because let's face it ... it was perfect for the invites! I designed some cupcake toppers to match the invites. You can find these in my Garden Party Bridal Shower Party Printable Collection. I couldn't stop at the dessert table. I did a brunch table setting to match. I picked up these yellow shimmer gum balls at Target in the new color-coordinated party section. Have you all seen that? It's like heaven right inside that cute little aisle. So I used these Garden Bridal Shower Invitations along with these Garden Address Labels. Ah I am so in love! I also designed a "Bride!" banner to go along with the invites that you can download + print with my party printables. These macarons are like little bits of sunshine. I picked them up from Essence Bakery. You might have seen my excitement in my instagram post. I adorned each guest's place setting with custom photo coasters from Shutterfly. I really, really love this idea. It makes the table more personal, and photos are great conversation starters. 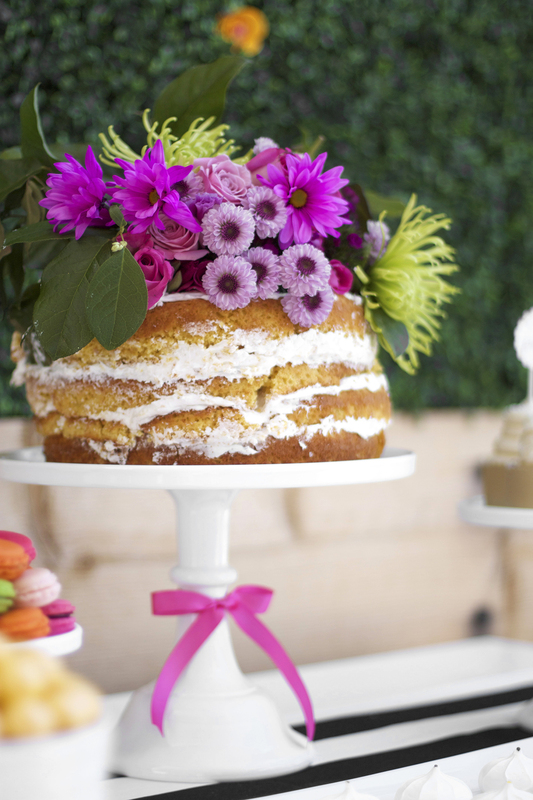 I love naked cakes, especially when they are topped with a heaping bouquet of flowers! I shared a tutorial on how to make a naked cake, so check it out if you're interested! Gold stripey straws are always a nice touch. I used the shower invitations as decor for the tables. Here is the tutorial for the DIY Gold Place Card Holders you see here. Here are those lovely coasters again! Since there were so many florals going on in the table setting already, I used a really simple green centerpiece I got at Hobby Lobby. The bag, pitcher, and floral decals from the Oh Joy Target Collection added gorgeous details to the party. Upload the design here (click "personalize" to get started). I also painted some chargers to match the invites. This might be one of my favorite things I have done so far. They are so pretty! Here is the full tutorial on how to make these DIY chargers. Here is the back of the invite. You can upload a photo of your choice and write your own text. I can't get enough of meringues if you may have noticed here and here. I can't believe I haven't yet talked about this canvas print yet. I created this canvas print on Shutterfly. I used the "Photo Gallery Canvas Print" and uploaded one of my sister's engagement photos. I did the 24 x 36, and it's breathtaking! This makes a great gift for the bride. Everyone can pitch in on this one. Download the link to my pillow design! If you're curious, here are my other projects for Shutterfly. Any brides in your life right now? Any other fun bridal shower ideas? I'd love the help for my sister's in June! Let me know in the comments! For exclusive DIYs and a free gift, sign up below! Thank you SO MUCH for following my blog! Thank you! Here is your free printable set! This is a sponsored post. However, all opinions expressed are my own. Thank you for supporting the sponsors that allow me to continue to provide you with creative ideas!